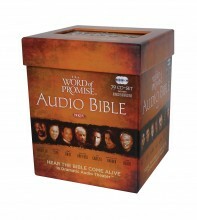 Featuring the voices of more than 500 popular actors, this faithful rendering of the New King James Version presents the Bible in more than 90 hours of compelling, dramatic audio-theater format. Includes an interactive Behind-the-Scenes DVD. This world-class audio production immerses listeners in the dramatic reality of the Scriptures as never before with an original music score by composer Stefano Mainetti (“Abba Pater), ” feature film quality sound effects, and compelling narration by Michael York and the work of over 600 actors. We purchased this set a couple of months ago. I love it! The quality of this work is amazing. It is not just someone reading the Bible to you. It is some phenomenal actors sharing the Bible. They are reading to you. It is as if a play is being acted out, yet all we have is the sounds and the words. It truly is beautiful. Do you know someone with problems reading? Perhaps you have a long commute? Many days, I put in a CD and let the Word permeate my home. I can’t say enough about it.